The three big hitters are playing shows at ASB Bay Park in Mount Maunganui on January 9; Church Road in Napier on January 10; TSB Bowl of Brooklands in New Plymouth on January 11 and Hagley Park in Christchurch on January 13. 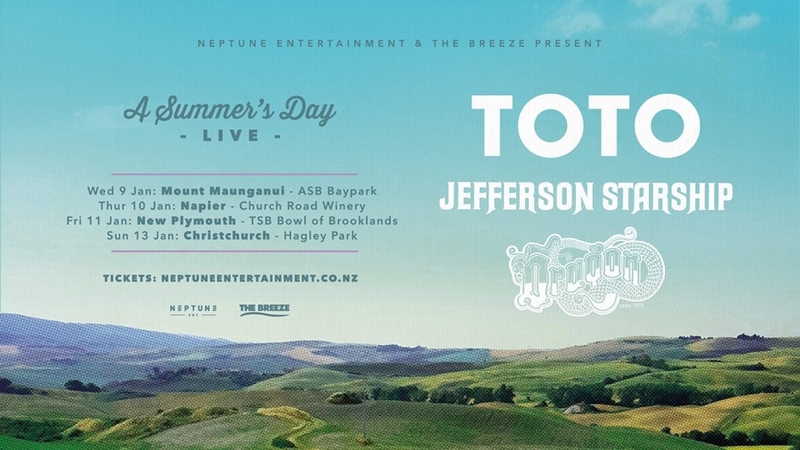 Presented by Neptune Entertainment and The Breeze, the TOTO-headlining series is close to sold out in most cities, but with Jefferson Starship just announced, remaining tickets are expected to be snapped up quickly. Jefferson Starship rose from the ashes of another legendary San Francisco band, Rock and Roll Hall of Fame Inductees, Jefferson Airplane. Between 1974 and 1984, the band released eight gold and platinum albums and 20 hit singles, including ‘We Built This City’, ‘Nothing’s Gonna Stop Us Now’, ‘Sara’,‘Volunteers’, ‘White Rabbit’, ‘Wooden Ships’, ‘Somebody to Love’, ‘Today’, ‘Miracles’,‘Count on Me’, ‘Fast Buck Freddie’, ‘Jane’ and ‘Find Your Way Back’. They also sold out concerts worldwide and lived out legendary rock and roll escapades. It’s fitting that Jefferson Starship should join the bill alongside other renowned US hitmakers, TOTO, who are behind some of the most iconic songs in history. Loved for hits such as ‘Rosanna’, ‘Africa’ and ‘Hold The Line’, TOTO band has released 17 studio albums, and sold more than 40 million records worldwide, since forming in the 1970s. Meanwhile, representing homegrown talent is the one and only Dragon. The Kiwi rockers boast hits such as ‘April Sun in Cuba’, ‘Are You Old Enough’, ‘Rain’ and ‘Still In Love With You’, and remain one of New Zealand’s most popular live acts. They were inducted into the New Zealand Hall of Fame in 2011 and with Todd Hunter and Mark Williams at the helm, they have continued to delight Kiwi crowds wherever they play. Held at the height of summer, promoters are going the extra mile to ensure each of the venues offer a comfortable and enjoyable concert experience. At ASB Bay Park in Mount Maunganui the show will be held on the grass field, with punters allowed to bring their own small picnic chairs. There is also VIP ticketing in all cities, bar New Plymouth. But instead there is reserved seating at the Bowl of Brooklands. The inaugural tour in the A SUMMER’S DAY LIVE series, TOTO, Jefferson Starship and Dragon, promises to put on a show like no other. With back-to-back hits; the perfect concert settings and summer in full swing; this is not to be missed.